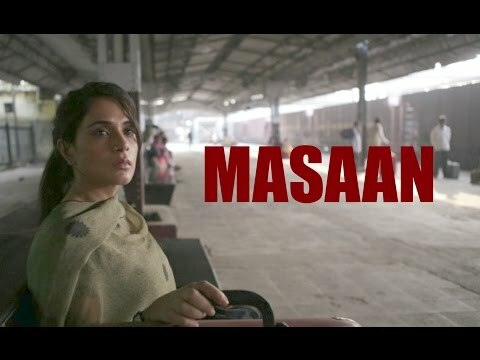 An Indo-French co-production, “Masaan” is a poignant tale of two young couples, whose lives are intertwined by fate, set against the backdrop of a crematorium on the ghats of the river Ganges in Benares. Educated and fairly independent, Devi Pathak — although living in a small town — is unconventional, experimental and unapologetic about her life. While the unexpected death of her lover Piyush has her internalizing her traumatic loss, she simultaneously balances to maintain truce with her father Vidyadhar Pathak (Sanjay Mishra), a former Sanskrit teacher, now selling knick-knacks on the bank of the Ganges. She is in disagreement with her father who is forced to shell out a hefty bribe to the police inspector in order to keep her “shame” under wraps. On the other hand, Deepak’s tale is a tragic romance of a promising engineering student born into the family of corpse-burners. He falls in love with an upper-caste girl, Shalu Gupta, who is willing to elope if her family opposes their alliance. For a maiden venture, Ghaywan’s “Masaan”, is a sensitively handled, honest film with some intrepid truths about small towns in India, giving you an insight into the mind of the internet-savvy youth. These are adroitly woven into the narrative. Varun Grover’s layered script, with a seemingly complex screenplay, oscillates between romance and melodrama. The screenplay unlocks simply, through the realistic lives of the characters, bringing to the fore, societal taboos like morality, sexual exploration and romance in a caste-driven society. Every character is intricately well-etched and the actors leave an indelible mark with their powerful but natural performances. Vicky Kaushal as Deepak, with his boy-next-door looks, is impressive. A bundle of talent, he slips into his character with unquestionable ease and sincerity. He steals your heart with his coy demeanour when he woos his lady love. You empathise with his pain and frustrations. The scene where he breaks down before his friends after losing Shalu is heart-wrenching. He is aptly supported in a realistic performance by Shweta Tripathi as Shalu, a collegian, who falls in love with his simplicity. On screen, they make an endearing pair. Richa Chadda with a stoically glum and a stubborn demeanor as Devi, borders on being a rebel without a cause. A misfit in her surroundings, she tells her father, “jitni chhoti jagah, utni chhoti soch”. While she portrays Devi with conviction, the streak of independence in her character is not entirely substantial. Sanjay Mishra as Vidyadhar Pathak, the small town Sanskrit teacher and father who is burdened with societal pressures, renders a realistic and brilliant performance. Plagued by the thought of the ignominy he will bring to his family, Saurabh Chadhary as Piyush, in a small but significant role, is convincing. Bhagwan Tiwari as the corrupt police inspector, Pankaj Tripathi as Sathyaji — Devi’s besotted colleague, and Nikhil Sahni as Jhonta — the earnest little boy who works for Vidhyadhar, make their presence felt. While the story and performances are intense, what breaks the monotony and provides relief, is the humour that is strewn occasionally in the form of taut one-liners and old film songs. The earthy background score along with the soulful songs by the indie band Indian Ocean is soothing and meditative. It encapsulates the flavour of the place and meshes well into the narration. Cinematographer Avinash Arun Dhaware’s camera work is fascinating. He brilliantly captures Benares in all its elements. The atmospheric lighting at the crematorium adds to the eerie and aesthetic value of the scenes. Overall, “Masaan” keeps you riveted emotionally and haunts you long after you leave the theater.